Data is central to digital transformation. We have seen many customers moving their data workloads to Azure which benefits from the inherent performance and agility of cloud. Enterprises are moving on-premises workloads to public cloud at an increasing rate. Results from the 2016 Harvey Nash/KPMG CIO Survey indicate that cloud adoption is now mainstream and accelerating as enterprises shift data-intensive operations to the cloud. Specifically, Platform-as-a-Service (PaaS) adoption is predicted to be the fastest-growing sector of cloud platforms according to KPMG, growing from 32 percent in 2017 to 56 percent adoption in 2020. Cloud data warehouse is one of the fastest growing segments. 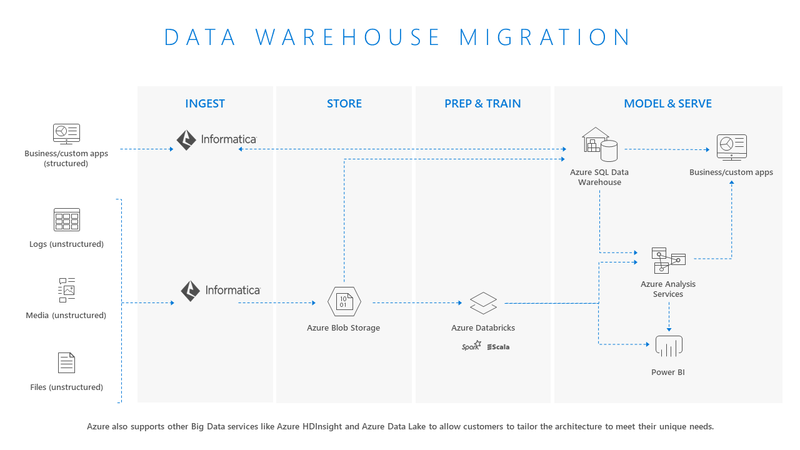 Azure SQL Data Warehouse (SQL DW) allows customers to unleash the elasticity and economics of cloud while maintain a fast, flexible and secure warehouse for all their data. Microsoft has partnered with Informatica, the leader in Enterprise Cloud Data Management, to help you modernize your data architecture with intelligent data management. So that you can build a cloud data warehouse solution that easily adapts and scales as your data types, volume, applications and architecture changes. Informatica’s AI-driven Intelligent Data Platform, with solutions purpose-built for Azure, is a modular micro services architecture that accelerates your Azure SQL Data Warehouse project deployment by automating your data integration development lifecycle, including connectivity, development, deployment, and management. Companies like AmerisourceBergen are changing the paradigm of patient healthcare by building a cloud-based advanced analytics platform on Azure to drive business innovation with new analytics-enabled revenue streams. Informatica offers out-of-the box connectivity to hundreds of on-premises and cloud data sources and pre-built interoperability to all Azure data services. Customers can eliminate data silos and deliver high-quality, trusted and secure data backed by enterprise-class data integration, data management, data quality, data security and governance solutions. For instance, an American office staffing company is beginning their journey to becoming a modern data-driven company with a strategic initiative to replace their on-premises data warehouses with Azure SQL Data Warehouse. To quickly start moving on-premises data into Azure, they leveraged Informatica Intelligent Cloud Services, Informatica’s iPaaS solution. Many customers like Life Time Fitness are taking a cloud-first approach to deliver competitive advantage through increased “customer intimacy” and driving operational efficiencies by moving to a modern hybrid data architecture that pulls data from anywhere at any time and can scale performance on-demand. Informatica’s intelligent data discovery engine, Enterprise Data Catalog, gives you a holistic view of your enterprise data landscape by cataloging all types of data and data relationships, significantly expediting cloud migration. Machine learning-based data asset discovery, visibility and preparation solutions ensures that no relevant or useful data remains hidden or obscure. Helping you transform big data into fit-for-purpose data sets. The Informatica Intelligent Data Platform offers comprehensive solutions for Azure, including data integration, data discovery and preparation, data lakes and big data management, master data management, data quality and data security to accelerate Azure deployment and deliver trusted data in the cloud, on-premises and across hybrid environments. To learn more, download Informatica’s workbook for Cloud Data Warehousing with Microsoft Azure, sign up for an on-demand webinar!